Antaeus Arts Education Outreach had the privilege – and the fun – of being part of Center Theater Group’s Middle School Playwriting Program (MSPP), which wrapped up in April. The program was launched in the 2009-10 school year, in ten diverse schools from the Los Angeles, Inglewood, Pacoima, Burbank and Santa Monica school districts. Paula Solano with Rob Nagle & Pacoima student. Michael Farmer Photography. At each school, a CTG teaching artist partnered with one English teacher each year to provide theater and playwriting instruction to one class of students in their 6th, then 7th, then 8th grade English class.. A local theater company was engaged in each residency, providing professional actor/teaching artists to perform the students’ work in a workshop setting. 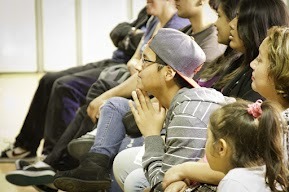 Antaeus participated with CTG teaching artist, Paula Solano, at Luther Burbank Middle School and Pacoima Middle School. We worked with Paula in all three years of the program. The opportunity to watch students grow over three years – not just physically, but also emotionally, intellectually and creatively – was unique in my Arts Education Teaching Artist experience, and very rewarding. At our first session with our CTG Lead Teaching Artist it was clear that we were involved in a strong alliance in line with Antaeus’ artistic priority of focusing on Text, Process, and Collaboration. In the sixth grade, the students were guided through writing monologues rooted in personal experiences. These pieces were largely either self-conscious, or self-centered, or reflective of fantasy interactive video games. The pieces were sometimes timid, sometimes dark, and sometimes hilarious. The first sign of the actor visit impact in the process emerged with the very first monologues performed. The students’ work became startling alive for them for the first time. They were amazed to hear the words they wrote turned into characters. They saw through the actor’s attention to and respect for the text, how pivotal their words were. The second year was devoted to scenes, and we demonstrated to the writers how characters act with each other, and how important those relationships are. The writers also saw through the actors the variety of ways to articulate their plots and their characters through the actions the actors expressed. The students began to flesh out their characters with inner lives and outward physical traits, which sometimes included accents and physical peculiarities. 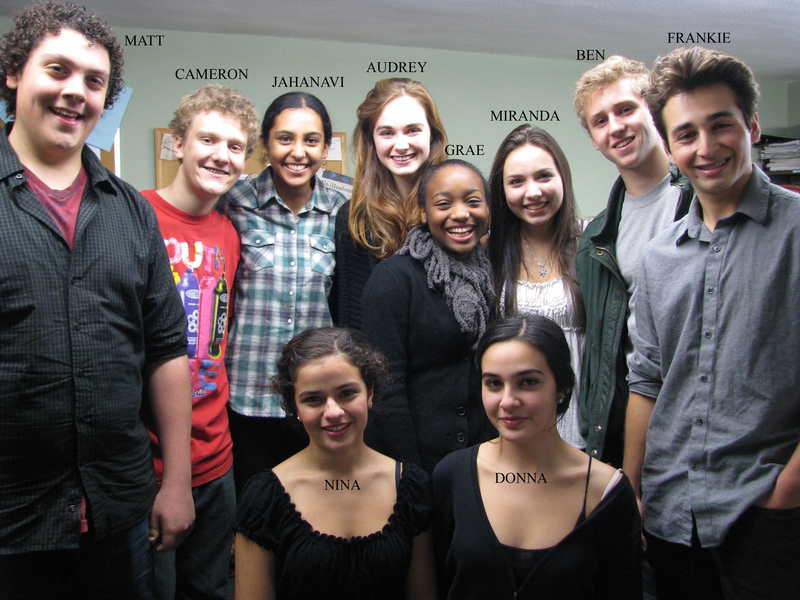 In the third year, the students collaborated with each other in various teams to co-write ten-minute plays. By this time, various students were writing roles specifically for some Antaeans, as they became more familiar with our work. The eighth graders tackled such topics as dyslexia, an abusive parent’s remorse, the friendship of an immigrant 7-11 manager and two homeless adults caught in tough times, pursuing post-high school studies, not to mention some quite sophisticated and modulated hilarious comedy. The students’ eyes had opened up to the world as well as to their own situations. They added research to their own insight. We joined the process with improvisation on the texts, and with suggestions relating to the clarity and specifics that actors (and directors) need to really make the scripts come alive. Trust and mutual respect had grown over the years of the program, and by the 8th grade the students were ready to take chances, to improvise with us, to dig deeper. Paula Solano, our CTG Lead Teaching Artist, shared her talent and skill as a writer with the students twice a week for several weeks at each school year. Many of the students started not having had any experience of theater. By the end of the program all of the students had developed an interest in and appreciation for theater. And a few budding dramatists were born! We actors visited each school 3-4 times each year, as first drafts were written and then revised. I observed the primary consequences of the actor visits to be the illumination of the actor’s respect for the text, and the demonstration of the power of a playwright’s writing to create vivid characters and stories that can be realized on stage. It was a singularly stimulating and memorable experience to have participated in the first three pilot years of this remarkable program. Our group of Antaeans included: Ramon De Ocampo, Rob Nagle, Rebecca Mozo, John Sloan, Joe Delafield, Linda Park, Gabe Diani and myself. We have grown as an ensemble, and we have all individually evolved as teaching artists. We look forward to collaboration with CTG on future playwriting programs. Antaean Janellen Steininger looks back on 3 years of the CTG Middle School Playwriting Program. She is also Chair of the Arts Ed Committee. Information coming to mailboxes soon on how you can support our Arts Ed Programming. 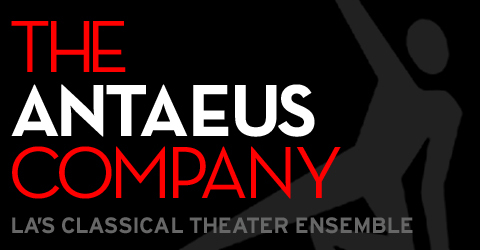 The Antaeus Company does not limit itself merely to staging works of classical drama ranging from Noel Coward to John Marston to Tennessee Williams to Jeffrey Hatcher (although, we do in fact do all those things. Very, very well). The other side of the Antaeus mission statement discusses its devotion to furthering education in the classics, and in my experience with the company, this has meant the education of the next generation of classical theater actors. But Antaeus is also active in classrooms all over the county, and last week, we were paid a visit by a class from North Hollywood High School. I can’t speak for everyone, but I loved performing for the students — the main reason being that it was really fairly recently that I would have been in that kind of field trip, so I have a special big-kid sort of glee performing for one. More than that, high school students are fun to perform for because you do not expect them to be judging the acting, direction, and technical aspects of the show against every other production this season; so it’s easy to let go of your paranoia and simply tell the story. After the show, the cast changed out of costume and came down to the edge of the stage for a Q and A with the students. We talked to them about the rehearsal process, the weeks of table-work, how the double-casting worked, how acting in a Marston play differs from a day on a TV set. Then we asked if, for any of them, it was a first time seeing live theater; of the two who raised a hand, one gave us a beautiful summation of her thoughts. She told us that she understood why more people didn’t want to go to the theatre; she told us that she had been afraid she wouldn’t understand what was going on and was fully prepared to simply pretend that she did (and this was before she knew it was a 400 year old play; “then I really knew ‘ok, I’m so not going to understand what’s going on.'”). But she went on to say that she not only understood everything she saw, but that she was fascinated to see how “people 400 years ago were doing the same stuff that people are doing now: the way men use women, the way that love so easily turns into lust, the way power corrupts…” are still things that she sees people dealing with, and that’s why theater is important; because if people saw that they were in the same mess today as they were 400 years ago, maybe they’d stop doing it. It just doesn’t get any better than that. We gave her an ovation. And now, here we are: the home stretch, the last inning, the sports metaphor that properly expresses how it feels to approach the last performance of The Malcontent. I face the end with sadness and satisfaction; I think we have thus far acquitted ourselves with dignity and style on the stage, and unceasing shenanigans and tomfoolery off it, both of which I will miss dearly. But it’s not an utter goodbye; so many of us are either Company members or Company member-adjacent that we’re nearly all re-uniting one way or another through Classicsfest 2011. For some of us, it’s Aphra Behn’s The Lucky Chance, a reading which will be directed by the one-and-only Liz Swain (although personally, I think she should stop picking such popular, everyday plays and go for something a little more obscure). 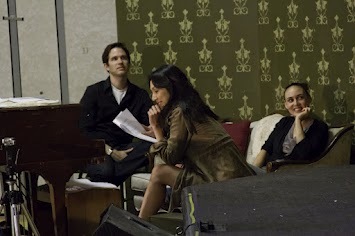 Others of us are joining the ranks of Macbeth, directed by Jessica Kubzansky. (There are countless others; I only mention these two because I happen to be in both of them and dreadfully excited at that.) But while the cast may continue on in one iteration or another, it will not be The Malcontent. The corsets, bum-rolls, tights, petticoats, and towering wigs have been shipped home where they belong and the words of the play will sink back into the silence of the Antaeus Library. We all find our love for theater somewhere. I didn’t “find” mine, it found me. My sophomore year of high school an amazing teacher tossed me into a Twelfth Night scene; Shakespeare grabbed a hold and still hasn’t let me go. So you can imagine my feeling of pride last Saturday when ten high schoolers took the Antaeus stage to perform for our 2010 ShakesAlive! Monologue Competition. But that isn’t the beginning of this story. Back in November a few Antaeus Arts Ed Committee members and I visited four schools, 16 separate classrooms, reaching out to over 600 kids to talk about performing Shakespeare. At the end of each class we announced the competition to the students, encouraging them to enter the first round of the contest: posting a video of their monologue online. 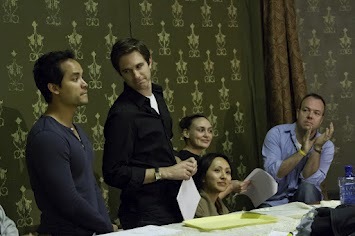 Antaeus Ensemble members then gathered to view all of the 34 entries, narrowing them down to ten semi-finalists. These ten were invited to the theater on December 4th to for coaching and to perform their monologue for their families and guests as part of the competition. The day started with a group warm-up led by Arts Ed Committee Chair, Janellen Steininger. Right away the students’ fierce love and commitment to theater was evident. Then, these vibrant young actors performed their monologues for our five coaches: Rob Nagle, Kitty Swink, Larry Pressman, Robert Pine and Allan Miller. After a little nosh, each coach was paired with two students to work on their material for an hour. The coaches wasted no time and had kids on their feet right away, taking them through their paces, breaking down each piece and providing critique from a professional vantage point. At 3:00pm, company members, friends of Antaeus, the contestants’ friends, family and — most importantly — the judges, filled the theater. Our esteemed panel of judges, all who donated their time, just as the coaches did, included: Jeanie Hackett, Harry Groener, Tony Amendola, Robert Machray and Simon Helberg. Once the lights went down, the students presented their monologues. All the performances had grown from the coaching sessions and everyone was up to the challenge of performing for this impressive audience. After the last monologue the judges retired to deliberate a grand prize winner while the contestants got the chance to mingle with the crowd and receive well-deserved accolades. The judges were impressed with the level of ability and understanding present in every performer. Eventually they decided that two contestants had tied for the winner of the grand prize! Along with awarding a second and a first runner up, the judges awarded TWO grand prize winners. 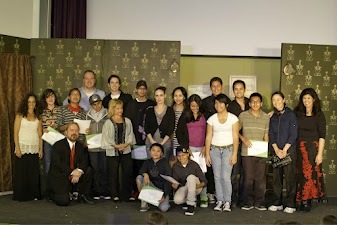 Every contestant received a copy of the play that their monologue was from as well as a certificate of entry. In addition, the second runner up received $25.00, the first runner up $50.00 and the two grand prize winners each won $200 AND an Arden edition of Shakespeare’s Complete Works. Once the decisions had been made, the judges took the stage to offer praise and some further guidance for the performers, and hand out awards. Afterwards, in true Antaeus manner, all were invited into the library for a reception featuring cupcakes, eggnog, and hot cider. I could not be happier to be involved with Antaeus’ continued commitment to reach into our community to inspire our love of the classics in the next generation of performers. Here is all our wonderful semi-finalists from the competition. Arts Education and Outreach programs bring our ensemble members into the classroom to make Shakespearean text accessible, fun and relevant to students’ lives. Through ShakesAlive!, we work with educators to develop culturally specific programs that move from Euro-centric to multi-centric and we give Los Angeles area students the opportunity to revel in both familiar and undiscovered classic gems of all cultures. Returning to William Tell Aggeler Opportunity School this Winter for Project 29: partnering at-risk youth with Shakespeare’s at-risk characters. Also returning to Cleveland HS in the spring! Antaeus was recently granted a new way for schools to find us — a listing on the LA County Arts For All Website – these listings were VERY competitive and we are now part of Los Angeles County’s first interactive website that supports the arts education needs of educators, community stakeholders and policy makers by providing centralized access to the tools and information necessary to achieve sequential K-12 arts education. Our Arts Ed Department also now partners with Center Theatre Group on their Annenberg Middle School Program. This is a new pilot, a 3-year action research program that will lead students through a playwriting residency with professional readings by actors from local theatre companies, mirroring the actual playwriting process. The goal is to improve and inspire students’ language and creative thinking skills, leading to student achievement in Language Arts. As part of our planned expansion in 2010, we held the first of a series of Teaching Artist Training Workshops last October. See a snippet here! 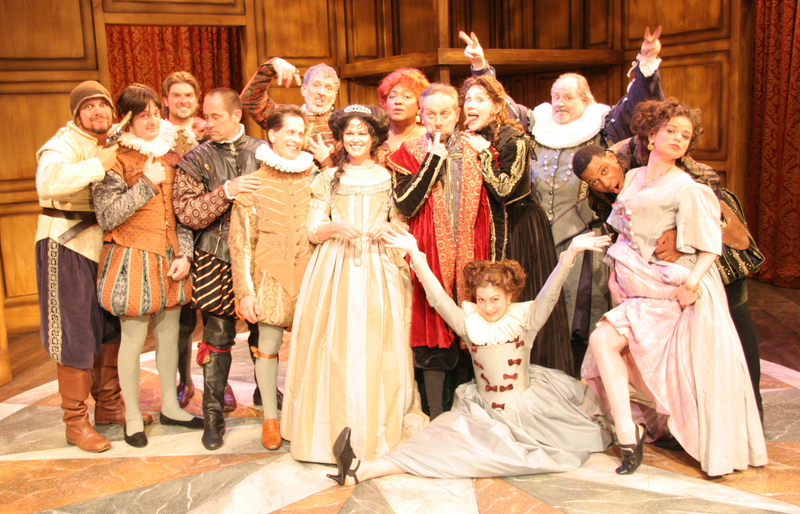 Stay tuned ~ our Shakespeare Monologue Competition also returns in 2010! Why is Arts Education important to me? You ask that question to any artist and they will probably chuckle like I did. To me, it’s like asking, “Why is breathing important to me?” I can only speak from my own experience and that’s exactly what I hope to achieve in this, my very first blog post. If I weren’t fortunate enough to have had arts education in my life I would have turned out to be a degenerate… seriously! I came close a few times in life. Since as far back as I can remember, the arts have always acted as a productive and healthy outlet for me. As a child, I would sketch and paint in order to quiet my mind and make sense of what I was feeling. I still do. Ms. Hemmings, my elementary school art teacher, taught me that whatever I created was beautiful because it came from my own personal truth. She praised my version of “American Gothic” a la “Ren and Stimpy.” I won my school district’s art award and a lot of self-esteem. Thanks Ms. Hemmings. Mr. Provost, my fourth grade cello teacher, not only taught me “Ode to Joy” but how to handle and care for something with love and grace. Thanks Mr. Provost! Bruce Altice, my guitar teacher, taught me how to wail on the guitar and not on others. Mr. Wahl, my senior year English teacher opened my eyes and soul to Shakespeare and poetry! These are just a few of the arts educators that played a major role in putting the arts into my life. I would like to conclude with recognizing my mother and father who nurtured my love for the arts at an early age and though not “artists” in the purist sense of the word are two of the most creative and original people I know. They taught me to look at things subjectively, empathize with others and seek out the beauty in life, my brother man, and myself. And most importantly, never settle for anything less than the truth! So to conclude, why is arts education important to me? 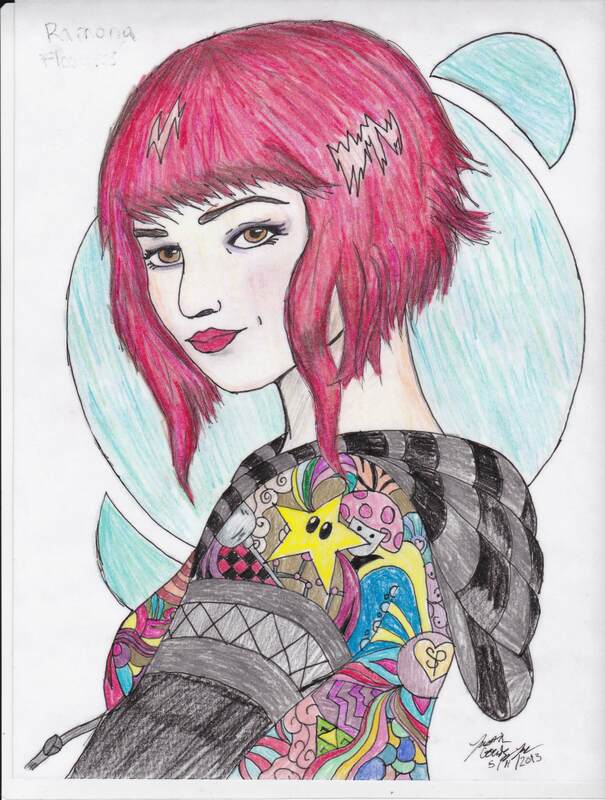 If I didn’t have sketching and painting as a means to quiet my mind and focus my energy I would have drugs and alcohol. If Ms. Hemmings never told me about my own personal truth I would have looked for it in another person, place or thing. If Mr. Provost never taught me how to hold and care for a cello I would have a difficult time holding and caring for anyone and anything I had the chance of laying my hands on. If Bruce Altice never taught me how to wail on the guitar at that very moment in my life, I would have been kicked out of school and thrown in juvenile hall for violent delinquent behavior. And If Mr. Wahl, never opened my eyes and soul to Shakespeare and poetry I would struggle even more than I do today with “finding the words to say.” And that’s exactly where I will end it. Do the world a service and create some art today! Shakes Alive! 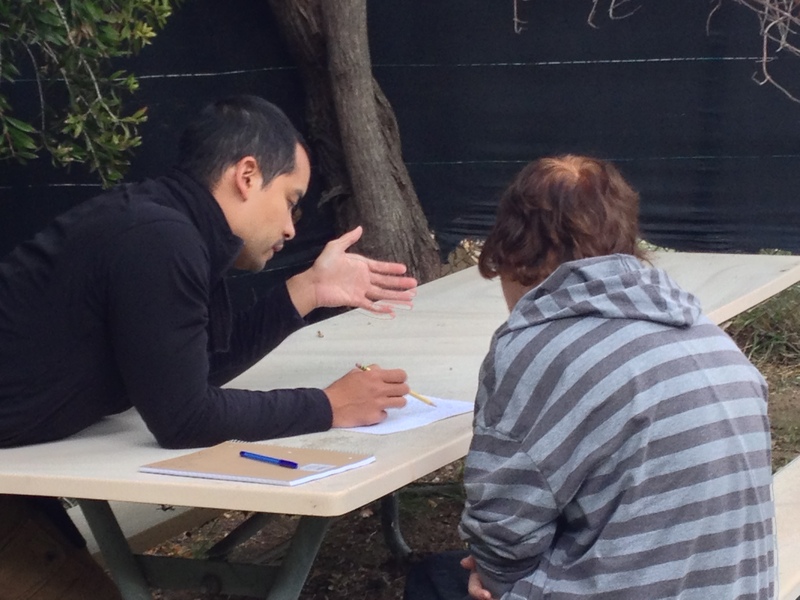 Is the education outreach program run by the nationally-renowned Antaeus Theatre Company. 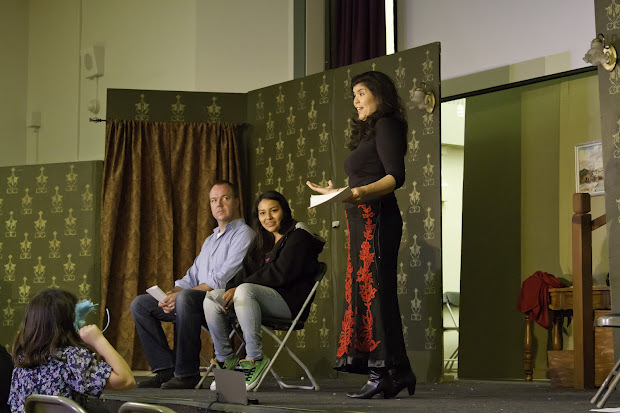 Dedicated classical theater actors, many of whom are recognizable from TV and film as well, encourage students in non-theater classes to dive into Shakespeare and other classic plays. Students discover how actors breathe life into these texts, and then they do it themselves. By analyzing rich, dense language, absorbing its meaning and beauty, and then performing it with energy and emotional truth, students gain confidence — and a deep appreciation for some of humanity’s greatest works of art. Our Lead Teacher works closely with your teachers to choose a text to bring to life in each class. Perhaps in an English class students are studying THE TEMPEST, THE CRUCIBLE, or ROMEO AND JULIET. In a science class, we can introduce a play to like the Pulitzer Prize-winning COPENHAGEN, which explores the concept of objectivity both in science and in our moral lives. 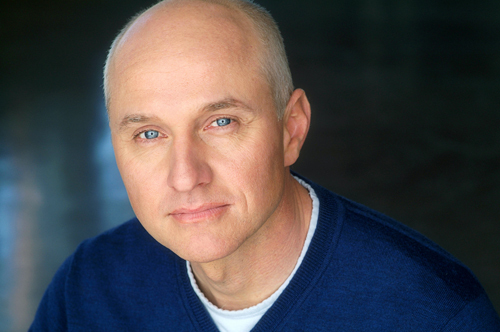 Each week one or two professional, successful actors visit to share their process in mining and examining a role. Students participate in acting games, improvisation, and “direct” the actors as they make choices about their performances. In so doing, students learn that they have power both as artists and readers, and that classic plays are dynamically relevant and exciting. What a swell weekend we’re planning for those who love Coward — and who doesn’t?!? Please join us for one or more of these special events! With the generous support of the The Noël Coward Foundation, Antaeus presents a weekend of events celebrating the master writer in all of his manifestations! Drawing on the title of an early Coward play, dozens of young, upcoming professional actors perform staged readings of some of Coward’s most fascinating, lesser-known work; brought to life by young directors, all mentored by noted, seasoned professionals. Plus, we have workshops on the life and style of Coward. See below for a detailed schedule. With Rhonda Aldrich, Antonio Anagaran, Ben Chang, Mark Deklin, Whitney Hudson, Antonio Jaramillo, Lynn Milgrim, Maggie Peach, Ned Schmidtke, Janellen Steininger, Joel Swetow, Kitty Swink, Reba Thomas & Laura Wernette. An Interactive Workshop for singers and non-singers to learn how to act a Noel Coward song. Reservations required – limited spots available! During WWII, London asked much of its countrymen–how much did Coward give? Complacency or freedom: Which would you choose? Cast: Josh Clark, Lily Knight, Melinda Peterson, Phil Proctor, Janellen Steininger, Josh Ansley, Eric Bloom, Kendra Chell, Brett Colbeth, Etta Devine, Danielle Doyen, Drew Doyle, Karianne Flaathen, Jeff Gardner, Alexandra Goodman, Aaron Lyons, Kellie Matteson, Mark Moore & John O’Brien. 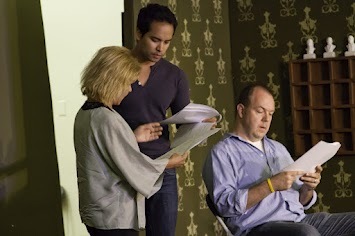 Antaeus actors come together for a exchange of ideas on Coward’s themes, world-view, and acting style. One woman’s fight against the rigid moralities of her time. Cast: Rhonda Aldrich, Ned Schmidtke, Brett Colbeth, Joe Delafield, Wyatt Fenner, Karianne Flaathen, Amy Hendrickson, Raleigh Holmes, Aaron Lyons, John O’Brien, Jason Thomas, Jocelyn Towne, Rebekah Tripp & Nicol Zanzarella –Giacalone.